The beautiful city is one of the popular travel destinations in the world. It's well known that Sydney has many things to see, a spectacular Oceanside locations, a marvelous climate, a bustling and adaptive culture and entertainment locations, including variety of characterized and captivating neighborhoods. The very successful 2000 Sydney Olympics further enhanced the city's prominence as a destination depicting for young and vibrant nation. Generally, Sydney is not only famous for centre of commerce but also considered as a wonderful coastal party town. Perhaps the key to Sydney's charming atmosphere is its town culture. Although Sydney is a busy metropolis with four million people, it still characterized or depicts qualities of a small town with friendliness and intimacy. In essence, many visitors to Sydney have observed the friendliness and helpful attitude of the local population. This may be because the Sydney is divided into many distinct districts. Being a coastal destination, summer is the most favored time for the tourists. Sydney's summer starts from October through early April. One should note, Sydney is the best place to visit any time of the year. Some visitors prefer the winter in Sydney as the climate here is better than the summer in other temperate countries. Some prefer winter because they wish to avoid the unbearable humidity ad sweltering sun that prevails during summer months in Sydney. However, for some travelers, the heat and warm climate that makes Sydney so attractive. Sydney's number 1 attraction, located on Darling Harbour in the heart of the CBD! Sydney Aquarium showcases the diversity of Australia's marine habitats and hosts thousands of aquatic animals, providing a unique and educational experience for visitors. Discover dugongs, sharks, penguins, dangerous creatures, turtles, rays and more! A great day out for the whole family! Bondi Beach is Australia's most famous beach and is located in Sydney’s eastern suburbs, only a few miles from the city centre - it is a great destination for people watching, beachside volleyball, yoga, community festivities, surfing and swimming. Bondi Beach draws the visitor, captivates them and forges memories of sun, surf and sand. Near the beach is the lively tourist strip - on Campbell Parade. Visitors should be a little wary. Strong rip currents can take swimmers by surprise and for those trying body surfing for the first time, the waves can be very powerful. Stingers can also be a hazard at certain times of year. Lifeguards patrol the often pounding waves, so it’s important to swim between the patrolled red and yellow flags. The Sydney Harbour Bridge offers breathtaking bridge offering amazing views of the harbor, the city and surrounding areas. For visitors who want to save time or money, walking across the bridge itself is another option. The views and photo opportunities are fantastic. Secluded beaches, quiet coves and soaring headlands predominate this harbor, which is considered one of the world's most beautiful. The Sydney Opera House is a multi-venue performing arts centre in Sydney, New South Wales, Australia where over 1,500 performances are staged each year, and immerse yourself in the dramatic world of Australia's premier performing arts centre. If you want to see the Opera House close up, and you can't afford tickets, or everything's booked out, try for a tour (booked through the House itself) or just wander around. Darling Harbour is just one of the most beautiful places in Sydney. Everything looks new and modern. Plenty of shops and restaurants along with several very good museums. Whale watching Sydney offers daily cruises from Darling Harbour and Circular Quay to watch Humpback whales. Sydney is connected practically to everywhere else in the country through air, bus and rail travel. Sydney has a very efficient and hassle free local public transport network and it's one of the best and cheapest way for visitors to explore numerous sites and attractions Sydney has to offer. The Sydney's City Centre is located along South Shore and it is where much of the city attractions are located. The Circular Quay an ancient dock for immigrants and the spectacular Sydney Opera House can be viewed from here. The east of City Center, the well known gay areas called Darlinghurst is located and previously it was known as notorious Kings Cross District. North east of the City Center is the up-market area and stretches up to the South Head. Here the visitors can explore the spectacular eastern beaches including the historical Bondi. If you want to view Sydney in an interesting and scenic way, the best way to visit the area by ferry, capturing the most popular, picturesque images of Sydney. The town called "Manly" is a well known spot in Northern suburbs, the sea side along Military Road cutting through very affluent properties of Neon Bay to Mosman is an important place to visit. By visiting, the central coast, the discerning traveler could mingle with the locals during weekends. You can even visit the nearby wine country, the Hunter Valley. One of the iconic sites frequently visited is the Sydney Harbor Bridge, constructed in year 1932. It is the longest single span arch bridge constructed in the world. It's popular landmark of Sydney. You will notice that the bridge is much bigger one in reality, than the photographs you see. Many visitors like to explore the bridge in a vehicle or walking. There are more adventurous or breathtaking or adrenaline pumping ways to explore the bridge. Take an escorted bridge climb with safety gear matching the color of the steel bridge, you can climb to the top of the bridge span. You can have a spectacular view of the fascinating "Rocks" or the "Rocky Spur" area from the top. Although, carrying cameras are not permitted, group photos are included in the cost of climb, individual photos are also available at extra cost. Another symbolic place to visit in Sydney is the Sydney Opera House. As the Sydney Harbor Bridge photos you have seen could never make up the real structure or the size of Sydney Opera House. The unique shape and roof domes with tiny tiles give scintillating effect perfectly blending with adjacent Sydney harbor. It's a modern architectural marvel which the structure composed of a series of modular buildings formed against each other. If you are interested in performing arts and music, Sydney Opera House is a the best place to visit. There are five performance venues including restaurants, and bars located within the Opera House. It's one of the of the popular places for art loving visitors looking for musical and stage events that are taking place daily. 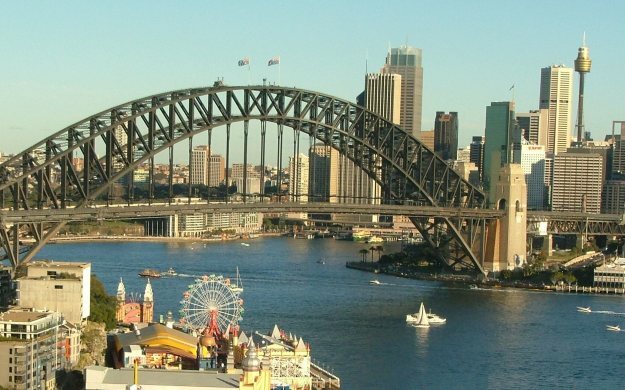 Sydney has various festivals through out the year and these attract many visitors to the area. Apparently, summer is the best season for such festivals. If you happened to be in Sydney during New Year, you can see extraordinary fireworks display that spectacularly illuminate the Sydney Harbor Bridge. The second day of the New year, you can visit the grand opening of Sydney Festival with gala celebrations with music, dance and theater. Besides above there are many things to do when you visit Sydney. Visitors of all ages have tremendous choices to select depending on their likings. Discover Sydney, on a Free Tour with your friendly and knowledgeable local tour guide. Experience the culture and lifestyle as we reveal the history, stories and secrets of Australia’s most popular city, on this 3 hour easy walking tour. Jason will provide you with a tour of boutique wineries with a difference - the ultimate Hunter Valley wine tour experience.This is definitely for lovers of wine and a great day out. The Manly Ferry is an easy and cheap way to get to Manly and to take a tour of Sydney Harbour. Any traveler can take a luxurious cruise around Sydney's beautiful harbor. Visitor to Sydney should never miss this and it will be a memorable one when you see sparkling water, spectacular surroundings and warm and sunny climate of Sydney. Also, while cruising you can capture fantastic photographic moments like, Sydney Harbor, Sydney Harbor Bridge and Sydney Opera House. You can have a fantastic view from the ocean. You can explore the beautiful or scenic surroundings by taking tour in a Luxury Coach. These coach tours are available daily and are the best and cheapest way to explore Sydney surroundings such as famous Hunter Valley Vineyards, the spectacular Blue Mountain, and fascinating Port Stephens. You can see Sydney in an adventurous and exciting way. Take an adventure tour in an open jet boat or enjoy a bird's eye view of Sydney scenic beauty while taking a helicopter tour. You will certainly enjoy the picturesque views of Sydney and will be fascinated by the panoramic city skyline boasting spectacular water fronts, gigantic city buildings, golden beaches and secluded bays. There are many more to see when you visit Sydney, your visit here will definitely be a memorable one.